No, these aren't the names of some new word puzzles in a Qantas in-flight magazine - they are in fact the names of 2 intriguing ways to engage with the city, in a random gift-giving kind of way. Bookcrossing is a 'subculture'/'movement' that was started in 2001 and basically it's all about leaving a book in a public place for someone to find, in the hopes that they will 'log' their find on the website (each book is registered before it is 'released' and so has a special code number) and that they will in turn release the book themselves when they have finished reading it. Some books have travelled around the world this way, exchanging hands 1000s of times, and have been diligently 'tracked' on the Bookcrossing website. 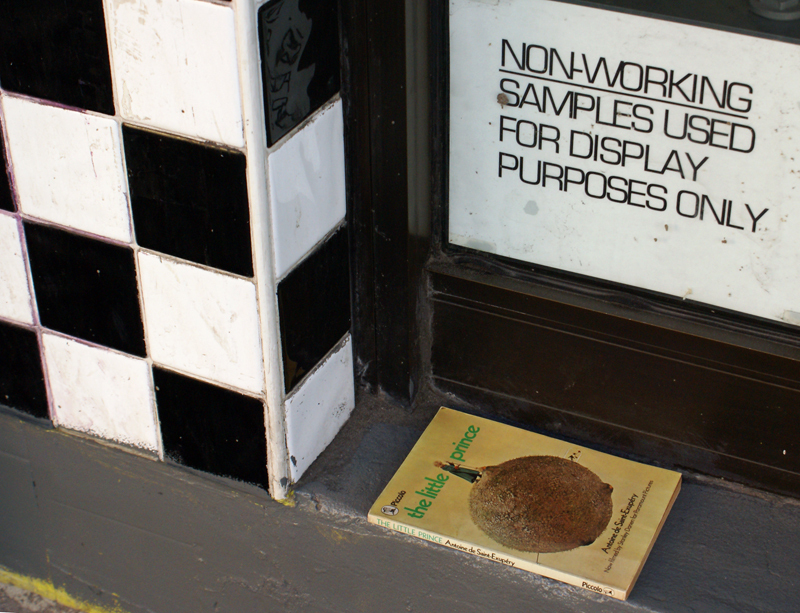 When we passed by an hour or so later, the book had gone. So far I haven't heard back about either book, but my hopes are high for The Little Prince. 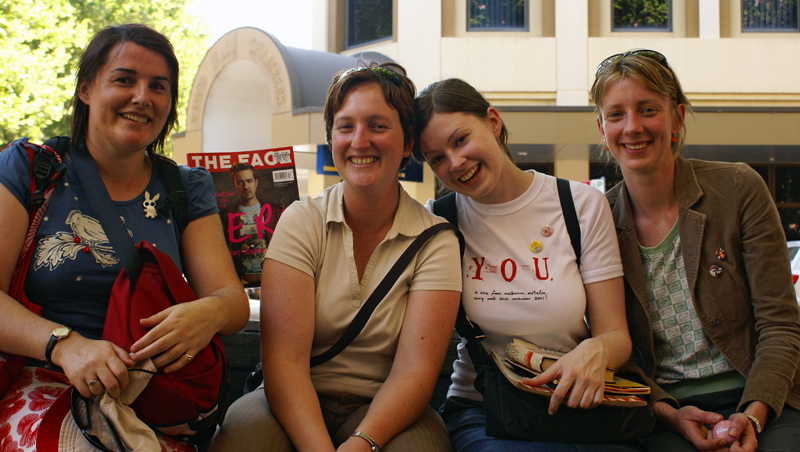 I can only but imagine who might have picked up the book, and what they thought about the whole Bookcrossing idea... I wonder if it might have been that homeless man we saw sitting near the spot I left the book? 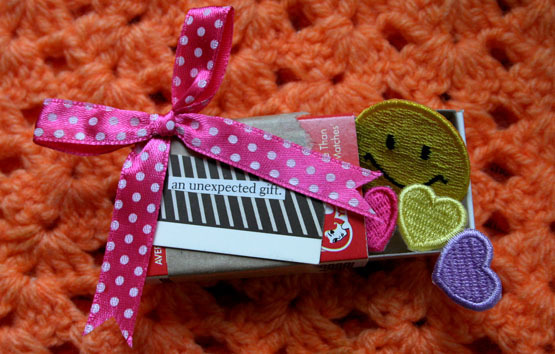 My second recent act of "urban gift-giving" was as part of the Matchbox Project. Last week, Sonya entrusted me with dropping off her Betty or Veronica matchbox, decorated with a pink polkadotted bow and filled with cute iron-on patches. Finding myself in town late on Thursday night, I left the matchbox on the stairs of Town Hall (which just happens to be one of my most favourite place for people-watching) and snuggled it into a corner of the stone stairs right where I imagined a young girl would sit while waiting for her boyfriend the next morning. What I really admire about both Bookcrossing and the Matchbox Project is that they allow you to delight in the randomness and anonymity of city life. The act of leaving a "gift" in a public place for a stranger to discover is a quirky little game when you think about it, and one perfectly suited to big cities full of anonymous strangers. Sonya's matchboxes are such a simple idea, but so incredibly creative and engaging - I was excited just to be the 'drop-off' girl! Imagine the person who discovers the matchbox, and is intrigued enough to follow the link to the blog where they stumble upon a whole new subculture of urban gift-giving, or the person who finds a bookcrossed book and by pure chance they are led to read a book they may never have picked up otherwise? What if this book changes their life? Sonya sums it up beautifully on her blog where she describes the Matchbox Project as a random act of semi-artistic kindness aimed at disrupting someone's day in a tiny but positive way. And who wouldn't like to have their day disrupted in a positive way..?! If anyone knows of any other urban gift-giving projects, let me know. But for now I am off to read the book Sonya's just loaned me, Street Renegades: new underground art. Intriguing. The week after coming home from the TINA festival, I was due to submit an entry into a bookbinding exhibition titled Inspired By May. The brief was to design a binding/book that drew its inspiration from the life and work of May Gibbs, the Australian author of children's books including the well-known Snugglepot and Cuddlepie. 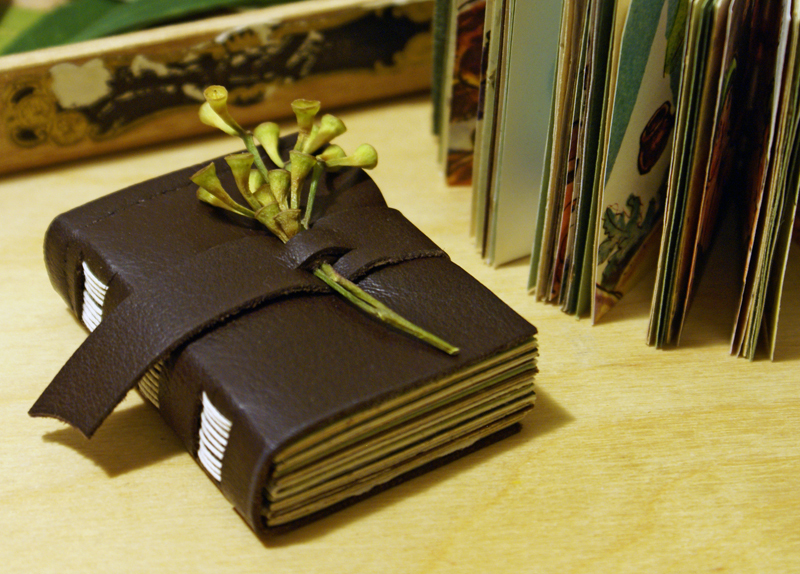 The pages inside the leather-bound books are a mix of textured papers in various shades of Australian bush, as well as a few feature pages that are fragments from a real Snugglepot and Cuddlepie book. I designed the books with a simple little closure that is held together by a couple of tiny gumnut twigs. The books will be exhibited at the Stanton Library in North Sydney from mid November until May next year. COOLEST EXPERIENCE - an early morning swim in the ever-so-freezing art-deco Ocean Baths pavillion! WEIRDEST TINA THING - the guy who spent the whole festival leaving random messages scribbled on fluoro post-it notes all over Newcastle. Helen and I must have collected dozens of them! BEST SPOT FOR CHILLING OUT - definitely the zine library/lounge room setup in the Octopod building. It was verrrrrry relaxing up there! Thanks to all who dropped by my stall at the zine fair to say hello - especially Karen, Sonya, and Phil - it was great to see you there! And other thanks to my travel buddies: DD, JD, Jo and Helen :) Oh so much fun that we had - can't wait 'til next year's TINA festival...!